O, That's Good! 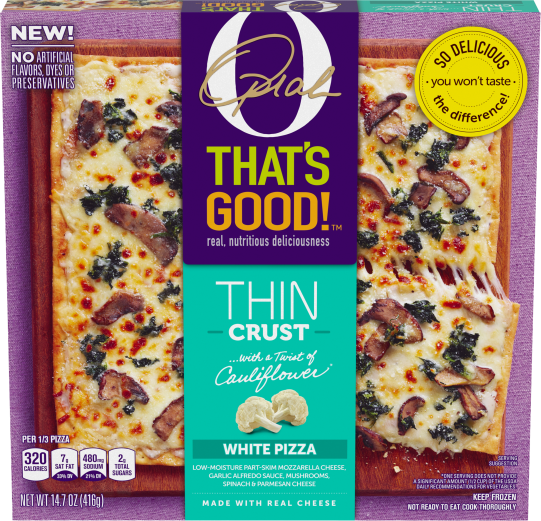 Thin Crust Pizza, White with Mushrooms, 14.7 oz | O, That's Good! O, That's Good! Thin Crust is 33% cauliflower, 100% delicious! Layered on top of that crispy crust are thoughtful ingredients like antibiotic free chicken. With no artificial preservatives, flavors or dyes, you can enjoy crispy thin crust pizzas a whole lot more. The crust is made with 1/3 cauliflower* but has all the great taste of thin crust pizza! CRUST (ENRICHED WHEAT FLOUR [WHEAT FLOUR, MALTED BARLEY FLOUR, NIACIN, REDUCED IRON, THIAMINE MONONITRATE (VITAMIN B1), RIBOFLAVIN (VITAMIN B2), FOLIC ACID], CAULIFLOWER PUREE, EXTRA VIRGIN OLIVE OIL, WATER, PALM OIL, OAT FIBER, CONTAINS LESS THAN 2% OF SUGAR, SALT, BAKING POWDER [SODIUM ACID PYROPHOSPHATE, BICARBONATE SODA, CORN STARCH, MONOCALCIUM PHOSPHATE], CORN STARCH, YEAST, NATURAL FLAVOR [CONTAINS CELERY], OLIVE OIL, ASCORBIC ACID); LOW-MOISTURE PART-SKIM MOZZARELLA CHEESE (PASTEURIZED PART-SKIM MILK, CHEESE CULTURE, SALT, ENZYMES); SAUCE (SKIM MILK, WATER, CANOLA OIL, CREAM CHEESE [PASTEURIZED MILK, CREAM, CHEESE CULTURES, SALT,CAROB BEAN GUM], PARMESAN CHEESE [PASTEURIZED MILK, CHEESE CULTURES, SALT, ENZYMES], GARLIC, CONTAINS LESS THAN 2% OF CORN STARCH, CULTURED WHEY, GARLIC POWDER, GUM ACACIA, LOCUST BEAN GUM, NATURAL FLAVORS, ONION POWDER, SALT, SOY LECITHIN, SPICES, SUGAR, WHEY); MUSHROOMS, SPINACH, PARMESAN CHEESE (CULTURED PASTEURIZED PART-SKIM MILK, SALT, ENZYMES). O, That’s Good! 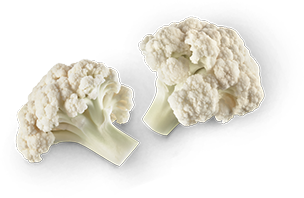 pizza is made with a crust that is 1/3 cauliflower* and fully delicious. We use premium ingredients like natural sausage with no artificial preservatives, flavors or dyes. Enjoy the cheesy pizza you have always loved in a whole new way.